I wish don't need to do such blog post. But I need to let this out or...my health will damage due to unsatisfactory. This is one 'emo' post! I was so happy when Mamonde launched Online Store at 11Street.my. Yeayyy!!! convenient. Love online shopping plus super excited to shop. I received RM20 vouchers and decided to do some shopping for Raya gift. Plus you see that photo banner? 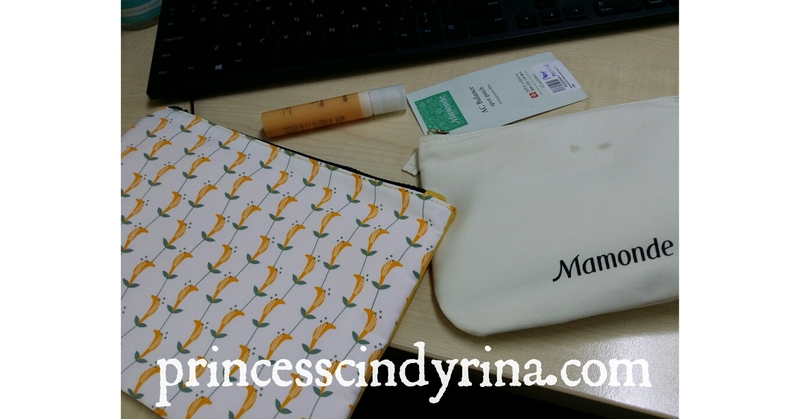 First 120 buyers at Mamonde 11Street.my Online store will receive that beautiful pouch and 50ml First Energy Serum. Oh yeay! Happy mode to shop and race out to be the first 120 buyers. I ordered Mamonde Basic Skincare set on 6th June 2017 through Mamonde Online Street.my. Dying to get my hands on those beautiful pouch. You see...Mamonde products are all flowers inspired products. Even their skin care pouch is hard to be miss. Super gorgeous to my eyes. I was nervously cross my fingers and wish to be the first 120 buyers. I waited for a week. No sign of shipping notification from 11Street.my. Already not happy. Gosh! I never have to wait this long on Shipping notification when I bought something online. Normally, I just need to wait 3 - 4 days. This is the longest. Trying to be positive with thought, they just launched the online store. Too many orders and trying their best to manage. I just need to wait my turn. WTH! Whoever knows me well , I am not this patient in character. I am one impatient person. But for the sake of this items from Mamonde which only can be purchase through their online store. Inner peace! Inner peace! Forgive! forgive them! Yeahhh..that was my 'Mantra' for the whole journey of waiting for Mamonde order through 11Street.my. I finally received my shipping tracking status on 14th July 2017.Gosh! super long waiting for just a tracking number. They are using Ninja Van courier service. Very the 'Ninja'. (feeling bitter with this word) Now I feel like ordering direct from China Seller. Do note on the remarks to seller which I clearly stated - " Please deliver during office hours. Mon - Fri between 8am - 4:30pm. Actually , my office until 5pm. But yet many days not even a sign of Ninja Van attempt to deliver the items to my office. No even a call. NO CALL!!! 15th June 2017 - I received sms notification from Ninja Van asking me whether I am interested to collect the parcel at somewhere near Ted baker which require me to walk far from my office. It was during Fasting month. You wanna me walk under hot sun and for sure I can't even quench my thirst after long walk due to fasting after that. Plus...I was so puzzle at that time. I paid RM7:30 for the shipping cost and I need to walk to get my parcel? What kind of courier service is this? I was thinking to myself , I should have bought it at the Mamonde Counter then. What are those convenient online shopping experience , then? Really? I have to go through this? Then I tracked the delivery tracking status and noticed they were trying to deliver to my office on 8:26pm and most of the time after the working hours. I still waited patiently. Inner peace, Rina! 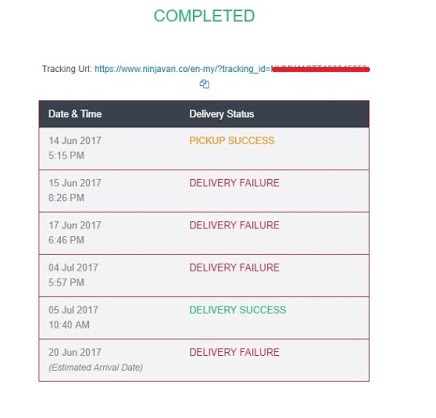 20th June 2017 - I notice another 'DELIVERY FAILURE' on the tracking status. They even tried to deliver to my office on Saturday. I received the sms notification while I was home during the weekend. I was like 'duhhhhh'!!!!! 'Beh Tahan' already!!!! I contacted Ninja Van support and highlight to them this is office address and please deliver the items during working hours which I stated 'Monday - Friday' between '8am - 4:30pm'.
" Upon checking, your item NVMYXXXXXXXX currently on vehicle for today delivery 20/6/2017 (9am-10pm) by best effort basis. We do apologize for the inconvenience caused and thanks for your patience and understanding. " Aiyah!!!! I also tracked my order online la...That is why I wrote to you and highlight what is the problem with hope you guys take note and do the work efficiently. It is good to know your delivery guy is working super hard even to deliver item until 10pm. Residential area maybe applicable on that hours. Oh! not ok for me. Who knows you call me at 9:30pm while I was busy trying to sleep on my bed? Annoying right? By the way, my delivery address is office address. Which is clearly stated! Duh!!!! At this point, I give up to receive my Mamonde items before Hari Raya holiday. Actually , I gave up after receiving such reply from a Customer Service who basically reply a customer without even reading the message clearly. Scripted reply! After Hari Raya holiday, I was in the office on 29th and 30th June 2017. I don't even give hope to receive my items because I was trying to be understanding. Many courier guy is on holiday and they will start delivering my item next week. In between of those days , I did contacted 11Street.my to highlight on my problem. What do I expect? The reply is fully scripted. E.g. ' We will check with our delivery service. Please track your items using the tracking number provided'. I was like 'duhhhh'!!!! You think this is my first time doing online shopping , is it??? I then contacted the seller who is Mamonde Online which I thought this is direct Mamonde. I was told Mamonde Online is fully manage by 11Street.my. Damn!!! no wonder the response on my inquiries doesn't even solve my problem. 4th July 2017 - Yeayyyy!!! Happy Independence Day!!! Independence day my foot...I was super 'angry bird'. I was driving back home at 5:50pm, for the first time ever through out my entire waiting process of Mamonde items from 11Street.my, I received a call from Ninja Van courier guy. Ninja : ' Ms Rina, I want to deliver your item. Your place is close! I feel like don't even wanna reply him. But I was thinking, he made his effort. I can't scold him. Its not his fault. His company don't notify him on my note. I then reply him nicely. Ninja : 'Then this item? How? I reached home yesterday evening with all my Mantra went 'Kapppooosshhhh'. Inner peace my foot! Forgive them ??? Angel no more! Quickly , on my computer. I went to 11Street.my page. 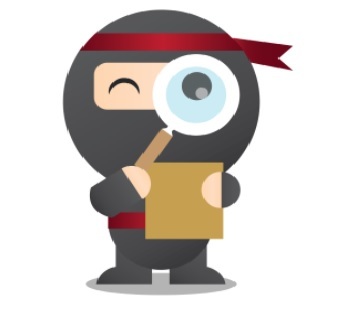 Clicked 'Return to Seller' and then went to Ninja Van support and message them to return the item to Seller. Don't even try to deliver the item to me. I hate you! I hate you all! Suddenly become super emotional. Goshh!!!! this is why...people says not to hold up your anger. I wish to release it out earlier so I don't feel that bad. 5th July 2017 - Out of the blue at around 10:50am this morning , I received this shabby looking parcel. Ish.. ish ..ish...Look at that!!!!! 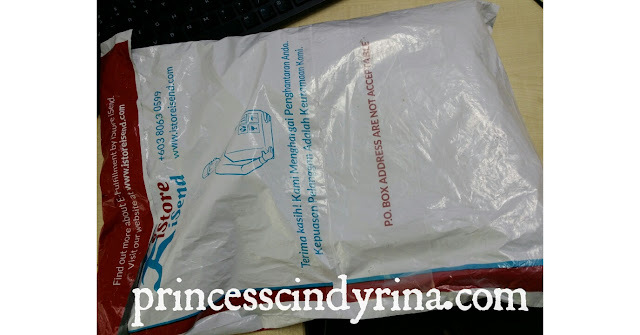 Crumple packaging, look like the package from a seller direct from China. Yeahhh!!! Ninja Van..don't know how many times this package change hands ???? Damn! I was like hesitate to even receive this at first. Reason? I just clicked return to seller and asked for refund. For goodness sake, I don't want any problem receiving the item and then the seller refund my money. Thats cheating! WTH! I was having that contemplating thoughts. But I look at that Ninja Van guy...aihhhh!!! so pitiful. He is just trying to do his job. Its not an easy job some more. I accept the items halfheartedly. Quickly, log on to 11Street.my and change the status 'Return to Seller' . Phewww!!! lucky manage to withdraw my 'Return to Seller' status. I then confirmed the purchase with moderate rating. I can't rate it dissatisfied because I love Mamonde products. Its not the products fault. Its the human's fault. I manage to open the package after my work done. To my despair, the items in the package...is wet and sticky. That beautiful pouch with black stain. So sad! How am I going to gift this to my friend???? The hell!!!!
" Hello! Seller... you are selling skin care products. Most of the items in liquid form. You think by throwing everything in one pocket bubble pack ..you items will be reaching you buyer safely , isit???" So...so..heart sick! My beautiful pouch with black stain all over. The items in that pouch was cap lose and all sticky wet due to the liquid spill out. My Mamonde First Energy Serum cap was lose open too and spill out the serum. Yikesss!!!! Goshhh!!! speechless. Who to scold now??? I keep scolding myself for itchy hand click confirm my purchase. WTH!!! Foolish me! 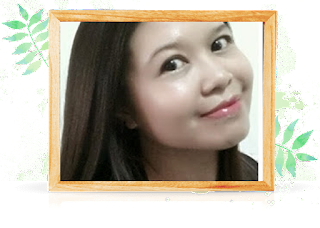 I bought many skin care products from Althea.kr. They ship to me direct from South Korea and item reach me less than 7 working days without any hassle to my door step. Note that!!!! less than 7 working days from date of order from South Korea. Not a month!!!! All items is wrap individually with bubble pack. I never ever receive any items with lose caps or wet due to spill out. Plus people don't throw in one pocket bubble pack! Do I need to teach them , this??? Gosh! how dare you becoming an online seller without even know this basic thing in packing the items. Normally, when I received items , I will shout out to instagram saying how happy am I. But this is the first time posting such unhappy instagram post to receive item. WTH! I wanted to return the item to seller. But afraid the need to going through such 'nightmare' again. Plus that yellow pouch is super pretty and afraid of losing it. I heard Mamonde was very upset due to way mishandling of their brand delivery to customer. Apparently, I am not the only customer having this problem. I received a call from Mamonde PR, Ms Angela from Circuit Communications and they really look into this matter seriously! Lucky , somebody can at least heal my pain. Feeling a bit cool off after receiving her call just now. Mamonde will be replacing that beautiful pouch for me directly. I told them its not necessary gesture. I don't mean to get FREE item through my post. I just too upset because I need to look for another gift from my friend after such long waiting and hassle I gone through. Yeayyy!!!! They insisted for me to receive it. Thank you. My friend is a lucky girl. I wish Mamonde hire internal people to handle their online store like other brand. Such ashamed if the good brand name and image tarnish just because of mishandling like this. I receive the shortest ever call from 11Street.my today. 11Street.my : Hello! I am Jay calling from 11Street.my.Is this Ms Rina? 11Street.my : So. you received your items and confirm its a delay shipping? 11Street.my : OK. Thank you. Me : ????? You called me just for this? At that point! feeling super annoying. Everything like starting to burst out from my head. Feel like wanna spill out #$%^^&**!! If this is a TV program the audio editor will be having a hard time editing my line, here. What the hell just happen here??? Scripted call??? Really annoying! Don't call me better, right??? Just read my status update on your system. Seriously!!!! Do you even need to call me and add salt to my wound ??? WTH! Update 6th July 2017: Received a call from somebody call Ronny, 11Street.my and he apologized on my ordeal. He offered me RM20 coupon voucher which I immediately reject. I told him don't even offer me anything from 11Street.my.I sincerely don't want RM20 and go through another ordeal again. Seriously, I went through that bitter experience due to RM20 voucher to purchase Mamonde online at 11Street.my. And here goes another RM20 voucher offer ? mmmmm....no Thank You! Anyway what item I can get from RM20? A pack of 3 in 1 Nescafe for my de-stress? That if I can use up that voucher without terms and conditions like need to purchase above RM50 or RM100 to use up that voucher. Fork out another cash out of my wallet? Haihhhh!!! so much of the compensation and good deal, huh? Thank you , ya for your sincerity! Appreciate this offer. I am glad that 11Street.my has the urge to look into this matter seriously and upgrade their service to serve the customer better and brings good online shopping experience to all. Good Luck! By the way, I am not trying to boast or anything but my time cost worth more than RM20 per day. You been through a lot of trouble just for getting the postage. I would feel the same way too. I can feel you. But not with ninja van but skynet. They keep my parcel afew days . Their office and my office is the same area not even 10 km far. Take 2 -3 day to send me. Need to email them every time to tell them, are you going to compensate me if my makeup product broken at your warehouse? It always happen when I order Althea product. Hi Ika, Skynet did the same to my parent. Tracked in system they said there is no such address. I called them and they act surprise when I told them Skynet just sent the other parcel at same address the week before. The CS told me...Oh! maybe the guy are just being lazy. I was like ...Wow!!!! speechless. Sorry for your lost! They just don't put their heart on doing the proper job. While many others are jobless and yet this people take their job lightly. Clapping here! Your post is very refreshing. You see, i've many positive blog post about this online site, and you are the only one who gave an honest #realtalk post. Yeah it is truly annoying when this thing happen. Hahaha i can't help laughing when you said 'inner peace' its like Master Oogway! Gosh, if after waiting one month you receive a non damaged parcel, still can accept but not when it is like that. But after one month in various hands, what can we expect, eh? Sad to hear your bad experience with the delivery and products! I'll stay away from company that doesn't deliver what they claim. Thanks for sharing! Wow! With that kind of service - no, Thank you for the RM20 offer. North worth it! Omg so terrible lah this 11street. I swear I'm just gonna maki them if this happen to me. It's great you expose them like this so others can beware of their service. SO BAD. Ouch! It reminds me about my experience with the courier company too. Some of them are not pro at all by just asking for IC number over the phone and intend to leave the parcel outside my house when I was not at home. So annoying. That's awful! What is up with Malaysian delivery services nowadays? Even my Zalora orders got botched up. Glad you got it sorted though. sounds like a really bad delivery service experience you had there :( hopefully they'll improve! I feel you! I've had two experiences already, almost a month - from package being sent to the wrong address, going missing in the warehouse etc to tampering with the date on the delivery notification slip. So these days, I will query the online seller or check the reviews first - if the courier service is langitnet, I will not buy!